Elenco 500 in 1 Electronics Learning Lab – MX909. NO soldering required. 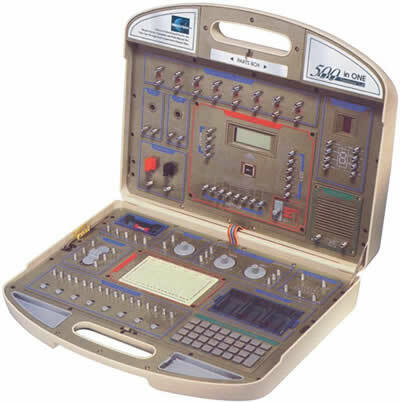 The Elenco 500 in 1 Electronic Learning Lab will teach you about electronics from A to Z. 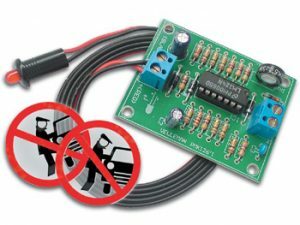 You will learn about electronic parts, how to read schematics, and wiring diagrams. All this, while building up to 500 different projects. 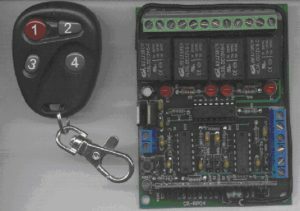 A very complete and inexpensive electronics trainer. 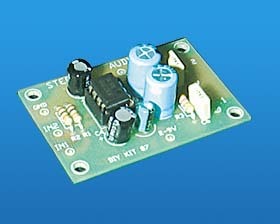 Breadboard Method: Featured in this advanced kit, this system is used by professionals and engineers. Just plug the components and wires into the special breadboard socket holes. No soldering is required. Everything uses battery power – no dangerous AC is required, so it’s safe for all ages. Labs come with all components and wires needed to build each project. NO TOOLS ARE REQUIRED. 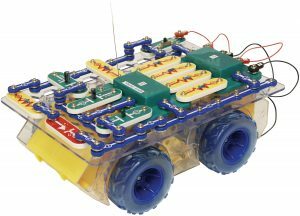 No prior knowledge is needed to assemble and build these exciting projects. Easy-to-read, illustrated, lab-style manuals take you through each electronic experiment step-by-step. All are designed for ages 10 & up, so these are ideal for MIDDLE SCHOOLS and HIGH SCHOOLS. Everything you need to build 500 Exciting Electronic Projects. Learn the basics of electronics and put your knowledge to work creating 500 different electronic experiments, special lighting effects, radio transmitter and receivers, amazing electronic sound effects, cool games and MORE! Includes built-in breadboard for easy wiring and connection of components, and an LCD (Liquid Crystal Display) indicates the information during the experiments in process! Build your knowledge by exploring amplifiers, analog and digital circuits plus how to read schematic diagrams. Includes transistors, transformers, diodes, resistors, capacitors, phototransistors, CDs, integrated circuits, speaker, earphone, LEDS, LED digit display! Fact-filled, illustrated, lab-style manual included.